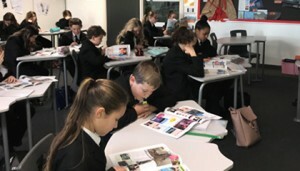 Pupils from four Ormiston Academies Trust (OAT) academies are participating in a new enrichment programme pilot which will see award winning children’s magazine The Week Junior build news clubs, debate days and career experience workshops into their school timetable. The move is a plan to engage pupil’s curiosity and help them to make better sense of the world. The Week Junior, the UK’s fastest growing children’s subscription magazine, which has had 50,000 subscriptions in two years, and OAT, a leading Multi-Academy Trust with 34 schools, decided to run the programme in response to growing evidence, such as leading child development expert Dr Jacqueline Harding’s research report done in partnership with The Week Junior, showing that explaining and engaging children in learning about current affairs has development pupil benefits. Enriching students’ education and inspiring pupils to use their curiosity and creativity is a major priority for OAT, who launched the OAT Enrichment Charter in 2016. This aims to develop pupils’ skills, talents and character. It also aims to nurture social and cultural awareness and understanding. The Week Junior, who are leading the programme, will provide schools with copies of the magazine every week so that pupils can use it as a current affairs classroom resource, sparking their curiosity. The Week Junior will also be hosting an exclusive magazine career experience day, launching an exciting competition for aspiring reporters and running a debating workshop in partnership with the English Speaking Union, allowing children the chance to express their new ideas and utilise their growing confidence. The Week Junior is the UK’s fastest growing children’s subscription magazine. The title is aimed at curious and smart 8-14 year olds who want to make sense of the world around them. The Week Junior launched in November 2015 and has already reached over 50,000subscribers. The Week Junior is filled with information that explains news and events in an engaging, informative and age-appropriate way, and encourages them to form and share their own ideas and opinions. From news to nature, science to geography, and film to coding, it covers a huge range of exciting topics, and gives children the information they need, the way they want it: concise, colourful, immediate, exciting. The magazine is adored by its readers, receiving plenty of reader feedback and ongoing positive posts on social media. It is also praised by parents and teachers for its crisp, accurate and informative explanation of the world’s news. The Week Junior had approval from Channel 4 journalist and Channel 4 news anchor Jon Snow who said, “I wish The Week Junior had been around when I was a kid – I’d have known so much more about the world in which I was growing up”. The Week Junior has received a number of awards including, Print Product of the Year at the British Media Awards 2017 and Launch of the Year 2016 by both the British Society of Magazine Editors and British Media Awards 2016. The Week Junior is published every Friday priced at £1.99. UK subscriptions are priced at £18.99 for 13 issues or £75 for an annual subscription; £60 to existing The Week subscribers to add The Week Junior to their subscription for a year. School term time subscriptions are available from £53.33 for 40 issues per year. Ormiston Academies Trust (OAT) is a leading, not-for-profit, Multi-Academy Trust which has been sponsoring primary and secondary academies across the country since 2009. OAT champions the excellent academic achievement and all-round wellbeing and development of the 26,000+ young people it serves and its vision is for all young people to have access to the highest academic, social and practical skills required to achieve their full potential, whether going on to study at a leading university or entering the world of work. As well as academic excellence, each academy shares the central ethos of being committed to enriching the lives of its students by raising aspirations and broadening horizons. Ambitions are nurtured through the Trust’s Enrichment Charter, which inspires students to develop skills, talents and character through a whole range of activities, to build and nurture social and cultural capital; use their courage, curiosity and creativity to find new ways of achieving their potential, and have the confidence, drive and resilience to follow their dreams.